Last year, I sponsored a contest for Remembrance Day. Although several people contacted me about it, no one actually entered. Sad, but this year I'm giving more notice, so please have a look. In 2009, Veterans Affairs Canada sponsored 'How Will You Remember' as part of its Veterans' Week activities. challenging people to use the historical photographs and videos available free on the Veterans Affairs website to create webpages, mashups, fan pages, etc. to commemorate those who've served Canada in the military, then to share those on-line and, as well, to link them to the Veterans Affairs website. I want to continue to encourage more commemoration of British Columbians' military and peacekeeping contributions. If you create a public British Columbia related web page, photographic blog post, or website, or post your family's British Columbia military related photographs on Flickr, etc. before Remembrance Day 2011, or, if you live in BC and you create such a remembrance on-line (no matter if it's BC related or not) and if you advise me by commenting on this post or by e-mailing me a short description and the web link, you'll be entered in a random draw for a prize of $50 (Canadian). You should also submit your link to the Veterans Affairs Remembrance Feed, and, if you can, tag your site, post, etc. with one of Veteran's Affairs suggested tags in the official poppy cloud below. - This contest is for individuals, not for government, academic, or professionally produced websites, although I will be happy to help promote those. - You should be willing to have your entries archived on-line in some appropriate way. I still hope the contest will be an annual one. Library and Archives Canada (LAC) has military related research guides, information and photographs, etc. Some LAC photographs can be used with credit to LAC. Check the descriptions for more information. Local museums and archives often have local military related research collections. Start by searching Memory BC and The West Beyond the West for information and photographs or contact your local museum or archives directly. 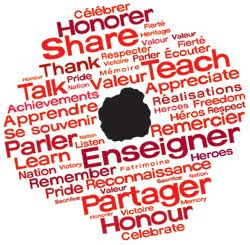 Poppy Tag Cloud, courtesy Veterans Affairs Canada.